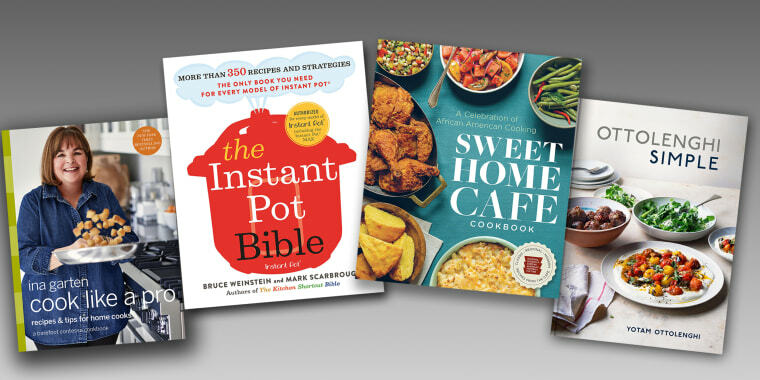 From the vegan to the barbeque pitmaster to Instant Pot evangelist, there's a cookbook for everyone on your wishlist. Whether you’re shopping for a serious foodie, an avid home chef, a vegan, a health nut or a passionate grillmaster, there's a cookbook for everyone on your list. Food plays a huge role in our lives. It brings people together, introduces new cuisines and cultures, and nourishes our bodies — and minds. So when you give someone on your list a cookbook, you’re offering them a gift that truly keeps on giving. Equipped with a new cookbook, they can try dishes they’ve never experienced before, for breakfast, lunch, dinner, and special occasions. Whether you’re shopping for a serious foodie, an avid home chef, a vegan, a health nut, or a passionate grillmaster, you’ll find a title that’s sure to please on the list below. Perfect for anyone who loves eggs for dinner, this book, from the editors of ExtraCrispy.com, covers how to make all the breakfast and brunch essentials. Perfect everything from crispy French Toast and fluffy pancakes, to barista-style drinks and even commercial favorites, like Entenmann’s Cake Doughnuts and Taco Bell Crunchwraps. Ina Garten, a.k.a. the Barefoot Contessa, has written twelve cookbooks, has a tv show, and has built a massive food empire — without any classic training. In her latest cookbook, she shares her secrets to cooking like a pro, including her tips for custardy, slow-cooked Truffled Scrambled Eggs, as well as the juicy Fried Chicken Sandwiches. This rural Virginia bakery counts Barack Obama and Mary Chapin Carpenter among its fans, and its charming new cookbook contains 85 southern baking recipes for cookies, cakes, pies, and more. Between the sweet-as-can-be recipes, the book is also filled with touching stories and photographs of beautiful landscapes. With more 100 mouthwatering food photographs, Lawson’s latest cookbook will help you create a fine dining experience right in your own kitchen. The recipes are simple, with unique ingredients and rich flavors, from fresh vegetable dishes such as Eastern Mediterranean Chopped Salad and Carrots and Fennel with Harissa to entrees such as Chicken Fricassee and Chili Mint Lamb Cutlets. With a foreword by Maria Shriver, this new cookbook provides the ultimate “brain food.” It’s filled with recipes that promote brain health, as well as overall well-being, such as Avocado Toast and Peanut Butter Amazeballs. Plus, a portion of the proceeds from the book will go to the Women’s Alzheimer’s Movement. Gaines believes there's no better way to celebrate family and friendship than through sharing a great meal together. Now, you can take a page from her (cook)book, and share one of her personal favorite recipes with your own family. Choose from 125 delicious recipes, like Chicken Pot Pie and Asparagus and Fontina Quiche. A perfect present for newlyweds, this book is filled with recipes that require no more than eight staple ingredients per recipe. Plus, they’re healthy, fresh, and use limited amounts of processed food. This book also provides shopping lists with pantry stables and essential cooking equipment. Chrissy Teigen proves that models can cook — really darn well. Her second book, a follow-up to the bestselling Cravings, features her relatable (and hilarious) voice, along with drool-worthy dishes jalapeno parmesan-crusted grilled cheese. She includes lighter options too, like a butternut squash and pomegranate salad with garlicky honey-Dijon dressing. Did you know that 40 percent of all food produced in the U.S. — where one in six people go hungry — gets thrown away? This cookbook taps into chefs’ innate knowledge of preventing food waste to help you make the most of food that might otherwise get tossed. Curated by the James Beard Foundation, recipes in the book include Swiss chard stem gratin, tahini pomegranate snapper collars, and asparagus bottom aioli. “Simple” isn’t usually a word associated with London chef Ottolenghi’s recipes. But his newest cookbook proves that his signature Middle Eastern–inspired meals can be prepared without as much effort as you think. In this book, all recipes fit at least one of these criteria: It can made in 30 minutes or less, with 10 or fewer ingredients, in a single pot, using pantry staples, or prepared ahead of time. Lo, a Michelin-starred chef and Iron Chef contestant, has written a cookbook that’s empowering and practical. Along with personal stories about life as a chef, she gives readers 101 simple yet sophisticated recipes that serve one, such as chicken pho, slow cooker shortrib with caramelized endive, duck bolognese, and even a single-serving New England clambake. In her latest cookbook, Tosi, the mastermind behind Momofuku Milk Bar, covers all the sugary sweets you could possibly dream of. Her signature naked layer cakes are included, but there’s also more approachable recipes for bakers who aren’t quite there yet, including two-minute microwave mug cakes, buttery Bundts and pounds, and much more. Bring home the taste of the Sweet Home Café, housed inside DC’s National Museum of African American History and Culture. Showcasing dishes with African, Caribbean, and European influences, this beautiful book includes recipes such as Pea Tendril Salad, Fried Green Tomatoes, Hoppin' John, Sénégalaise Peanut Soup, and more, along with stories that illustrate the pivotal role that African Americans have played in American cuisine. Chef Chloe Coscarelli’s New York City restaurant, By Chloe, revolutionized how people think about vegan food. She’s proven that plant-based recipes can be exciting, flavorful, and filling — and healthy at the same time. Even carnivores won’t miss the meat in recipes like Smoky Grits & Greens, Mango-Guacamole Crunch Burgers, and Sea Salted Chocolate Chunk Cookies. In De Laurentiis’ latest, she goes back to her Italian roots, while adding her own unique Californian and American influences. Here, shares somewhere lighter, no-fuss versions of authentic Italian classics, such as Spaghetti with Chianti and Fava Beans, Asparagus with Grilled Melon Salad, and Avocado White Bean Dip. Give this to the grillmaster in your life. Symon’s recent release covers his favorite food — meat — with over 70 finger-licking recipes that draw inspiration from all over the country, including dry ribs from Memphis, wet ribs from Nashville, brisket from Texas, pork steak from St. Louis, and burnt ends from Kansas City, to name a few. This book will make a perfect gift for your friend who’s obsessed with her new Instant Pot. With more than 350 recipes, along with instructions and timing for every type of Instant Pot, this book is the most Instant Pot cookbook ever published. You’ll find recipes for everything from hearty breakfasts to healthy sides, from centerpiece stews and roasts to decadent desserts.